Marseille is a city of 2 sides — traditional and gritty, and seeing both in a weekend is possible. Charming neighborhoods like Panier in Marseille co-exist alongside historic attractions like Château d’If near the city’s coast. There are plenty of things to do in Marseille in 1 day or 2; and this post tells you how. 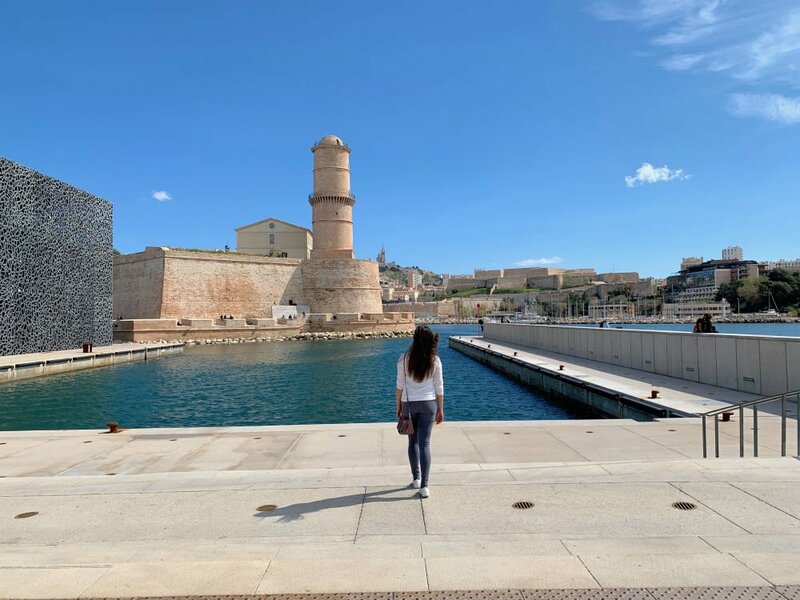 If there’s one rule to follow to discover the best of Marseille in a weekend, it’s to just keep walking. 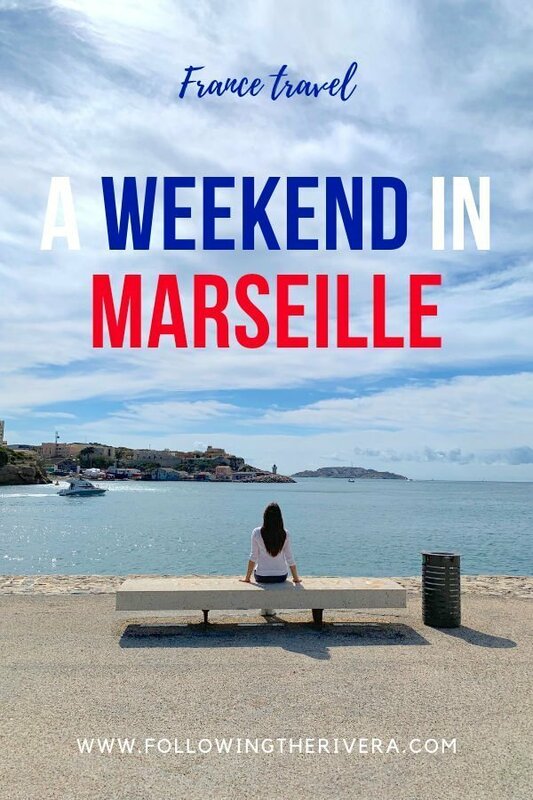 A weekend in Marseille – how do I reach Marseille? The second largest city in France is located on the south coast of the country in the province of Provence. Its main international airport is Marseille Provence Airport, which is approximately 27km (17m) from the city. There’s public transportation available to the city centre, but it’s not a straightforward journey and includes several changes. Still, if you have time and want to experience Marseille metro and bus, go for it. If not, you can follow our footsteps and take an Uber. We found Uber to be pricier in Marseille than other places where we’ve used the service. To give you an idea, a 22-minute drive to our hotel in the city cost €42 ($47/£36)*. For budget travelers, I recommend taking the bus and metro and saving your money for the city. Without a shadow of a doubt, the first place to head to in Marseille is the old port (Vieux Port). It may be the most touristic part of the city, but it’s a good place to get your bearings. Walk the entire route of the promenade, taking a moment to browse any market stalls, or watch live street performances. Vieux Port reminds me of the Rambla in Barcelona or Piccadilly Circus in London. It’s the place where everyone goes. The boats in the harbor take centre stage of the old port. It’s particularly striking when the sun’s shining, and can you see the light bouncing off the water. From here, it’s possible to take a day trip to nearby Calanques National Park. Truthfully, I can’t say much about the buildings immediately around the port. There are many outdated buildings, and not in the flattering way. Still, you can find several hotels here along with restaurants that attract coach loads of tourists. There’s one noticeable landmark that stands out above them all in Marseille, and that’s the Notre-Dame de la Garde. Situated at the highest peak in the city, you get a clear view of the basilica once you enter Vieux Port. 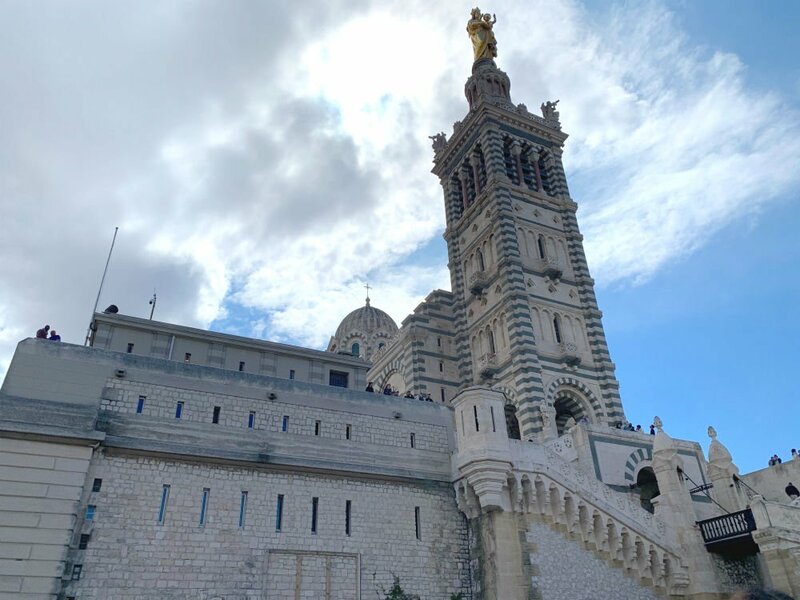 There are 2 churches inside Notre-Dame de la Garde – lower and upper. The lower church, also known as the crypt has been carved from the rock in Romanesque architectural style. It’s much smaller in size and simpler than its upstairs counterpart. 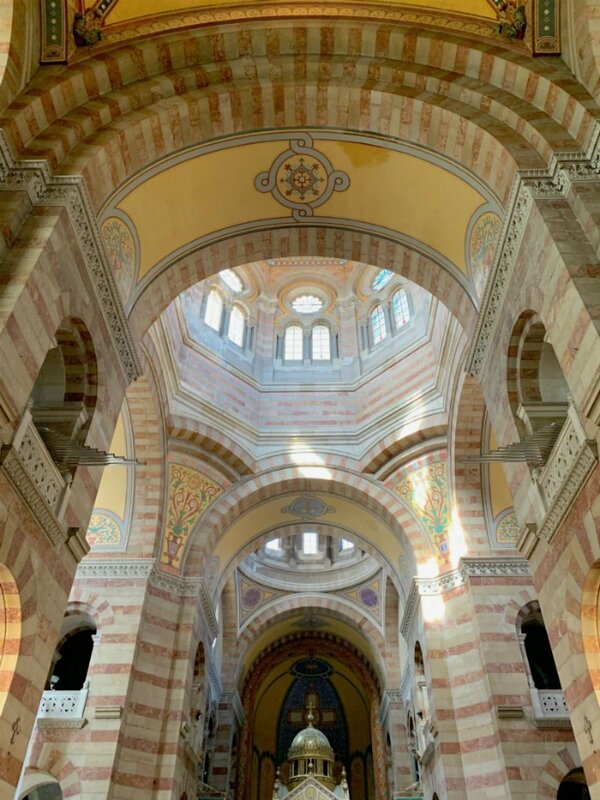 The upper church in neo-byzantine style is bursting with color and mosaics from every angle. Take a seat on one of the pews to admire the entirety of the church. It’s the most visited site in Marseille so don’t be surprised by the number of people that’ll be there. Even so, you can still enjoy the ambience and detail among the shuffling people around you. The upper church of the basilica is on the sixth floor (you can take the elevator or stairs). It’s the last floor and also the highest point in the city. 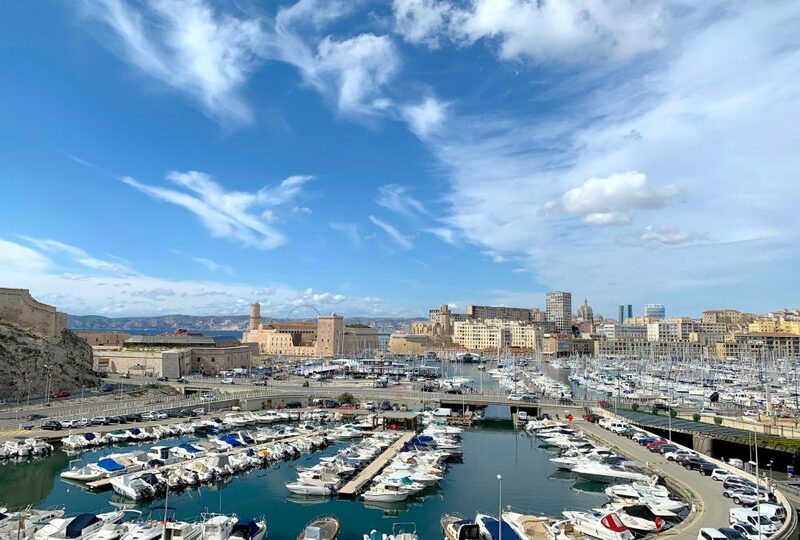 As you exit the doors to the outdoor terrace, you’re greeted with some of the best views of Marseille. Even with plenty visitors around, it’s possible to find your spot and take unspoiled photos. I also recommend going to the terrace on the fifth floor, and even walking around the ground floor. There are several good photo and Instagram worthy opportunities here. Best way to reach Notre-Dame de la Garde? The best way to reach the basilica in the sky is on four wheels. It’s a long way up and also a steep one too. If you don’t have your own car, there are plenty of other options. From Vieux Port, you can hop on board the cute but touristy petit train. It costs €8 per person for a return trip and is also a novel way to see the city. It’s open-ended on the right side however, so not so pleasant if it rains! Another way to reach the basilica is by bus. The no. 60 bus also takes you from the old port directly to the steps of the church. It costs €2 per person each way and you can pay on the bus. From one basilica in the sky to another on ground level. 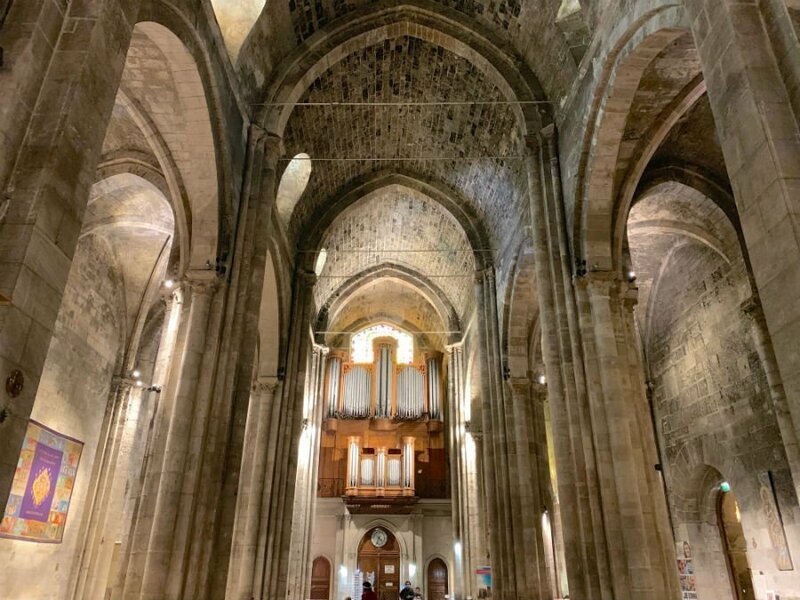 Marseille Cathedral, or Cathédrale de la Major in French, is one attraction you can’t miss on your Marseille weekend break. By this, I mean, its size is so grand you cannot miss seeing it. This Catholic church is a national monument of France, reflecting neo byzantine-romanesque style. It’s just as impressive inside as it is out, with dozens of murals, marble and mosaics to tantalize the senses. Marseille Cathedral’s also in a location of the city that’s near the waterfront, Quai de la Tourette. And it’s here where you’ll find another of the city’s top attractions. For those rainy days in Marseille — and when it rains, it really pours — this museum saves the day. As its name suggests, the museum curates the history and culture in the Mediterranean basin throughout the ages. The exterior of the Musée des civilisations de l’Europe et de la Méditerranée is also just as impressive. This cube-shaped building measures 160,000 sq ft, housing exhibits on 2 levels. It’s open every day except Tuesdays, and there’s an entrance fee to access the museum. Check the website for the most up-to-date prices and exhibitions. Connected by bridge to the Museum of European and Mediterranean Civilisations is the Fort-Saint Jean. It was built in 1660 by Louis XIV at the entrance to the old port. The fortification became part of the museum in 2013. Parts of the buildings are now exhibition spaces and a documentation centre. This imposing, yet striking, Roman structure is one of Marseille’s oldest buildings. 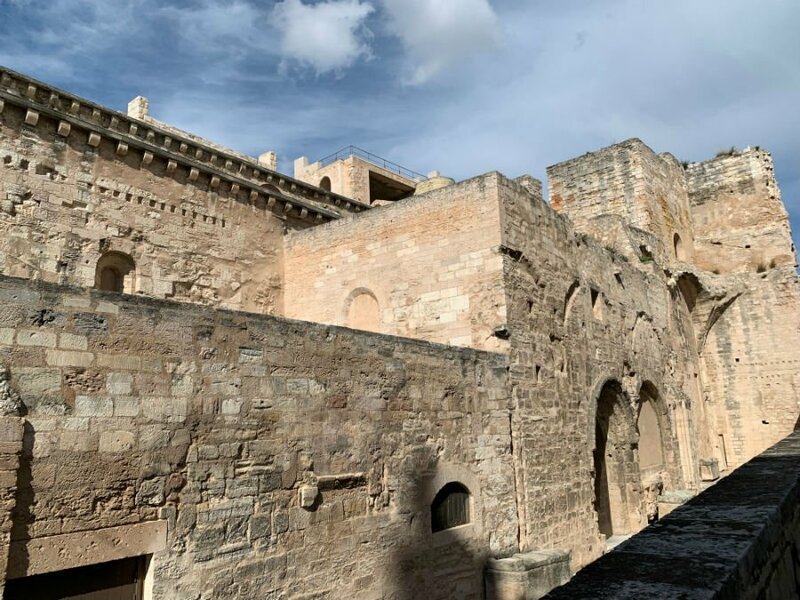 Named after Saint Victor of Marseille, the abbey dates back to the 5th century. As well as a church inside, the crypts are also a museum in itself. There are relics, paintings and even skulls dating to the 3rd century. The interior’s quiet, archaic and mysterious. Entry to the abbey is also free, leaving no excuse not to add this to your Marseille weekend itinerary. We lost count of how many times we walked around the Panier neighbourhood in Marseille. The first time was just by chance, as we were finding the way back to our hotel in La Joliette. 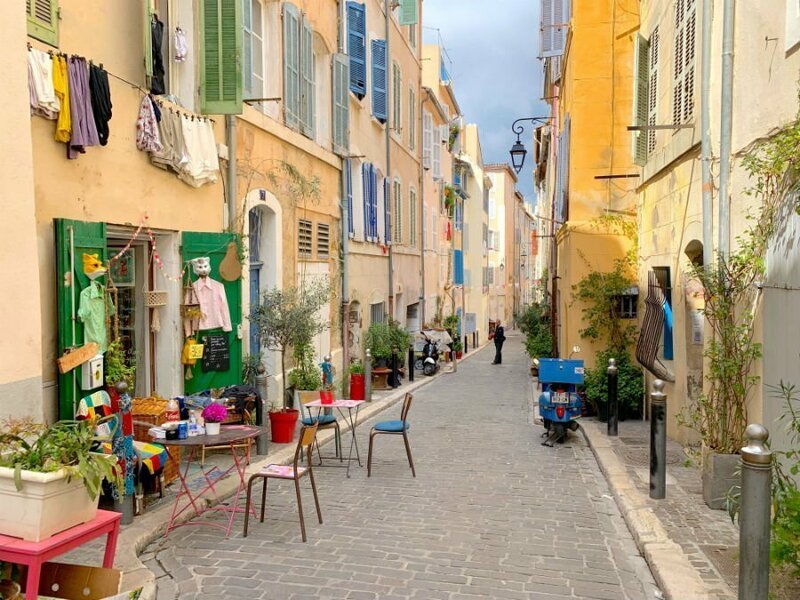 Panier neighborhood in Marseille is a series of small winding roads, showing local life at its best. Colorful front doors and window panels beckon you and your lens around every corner. It’s rustic, away from the crowds and very Mediterranean. There are a few independent cafes, restaurants and also stores in the area. I urge you to take a coffee, pause and soak up the atmosphere. What is Marseille famous for? Marseille is well known for several things. As well as its main attractions, it’s also known for its products. 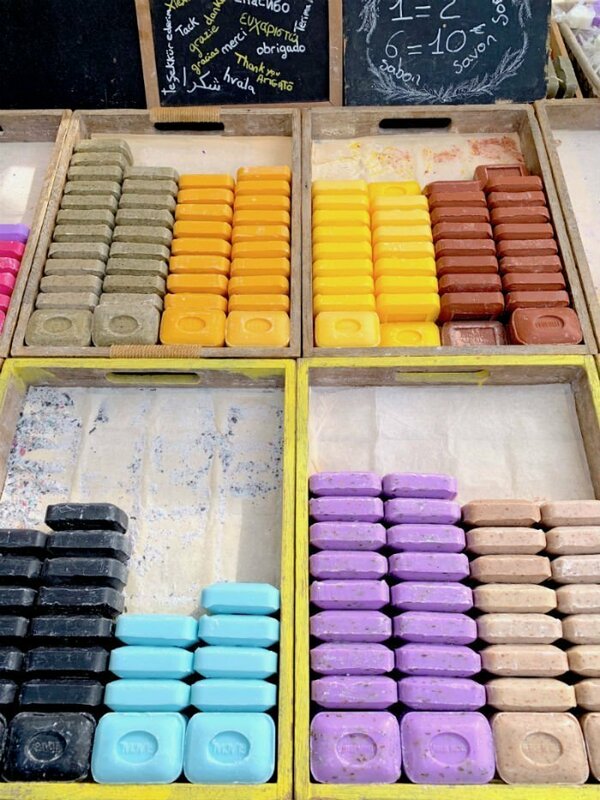 You can find one of its most popular items, Savon de Marseille, everywhere, and in different fragrances too. While we didn’t take any ourselves, I did notice that prices vary between places. To put it simply: the less touristy the area, the cheaper the price. Don’t visit Marseille without trying the local sweet biscuits called ‘Navettes’. These oblong-shaped biscuits resemble the shape of a boat and are usually prepared for the Christian holiday of Candlemas. Recipes can differ, but typically they’re perfumed with orange blossom water. Something we didn’t know about Marseille before visiting was its high number of Italian descendants. In fact, over one third of the Marseille population can trace their heritage back to Italy. Saying that, there are a dozen of very good, and authentic, Neapolitan pizzerias in Marseille. For over 4 generations, Chez Etienne’s family-run business has been serving up freshly baked pizza with plenty of creamy mozzarella. La Bonne Mere is another excellent Italian pizzeria near Notre-Dame de la Garde. Be sure to make a reservation before visiting because tables here go fast. 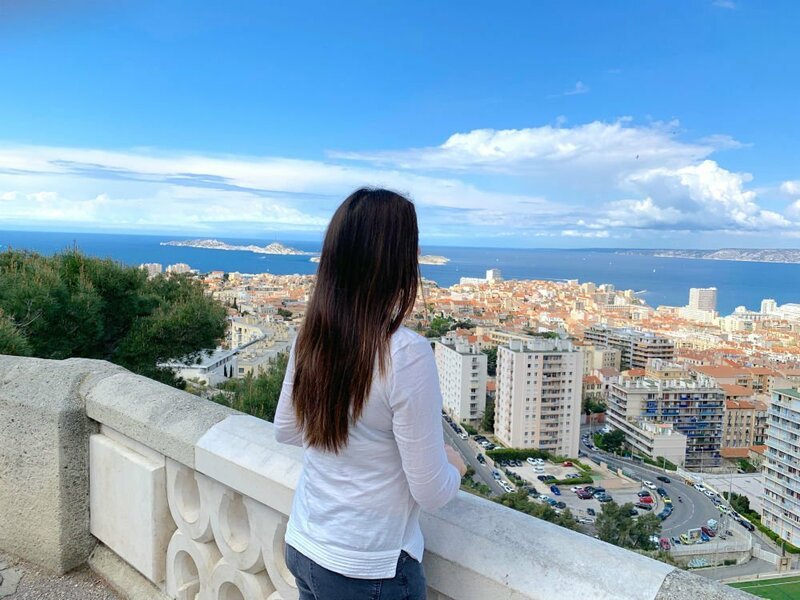 A weekend in Marseille – where to stay? 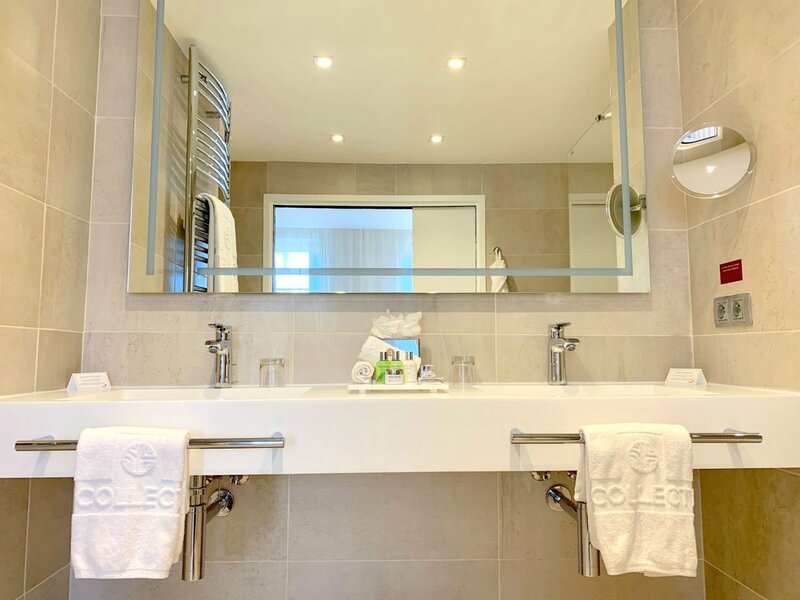 We couldn’t have found a better place to stay than NH Collection Marseille. 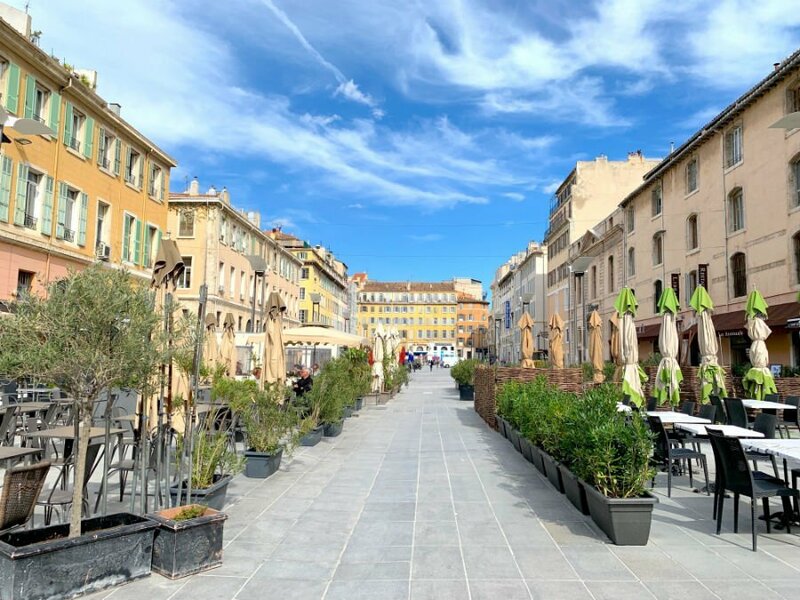 Its location in La Joliette neighborhood is central and also within walking distance to the central sights in Marseille. The hotel’s also right by the charming Panier neighborhood in Marseille. It’s the place where you get a feel of Marseille life up front. Our suite was bright, light and also very generous in size. The separate living area with sofa and TV leads to a grand bedroom with king bed. My favorite feature, however, was the bathroom! There’s a bathtub and separate shower room, both with rainforest shower options. It was the most relaxing way to end a day of exploring the city, and we can’t wait to return. The hotel manager, Victor, and all the staff, including their guest relations manager, Germana, are exceptional. 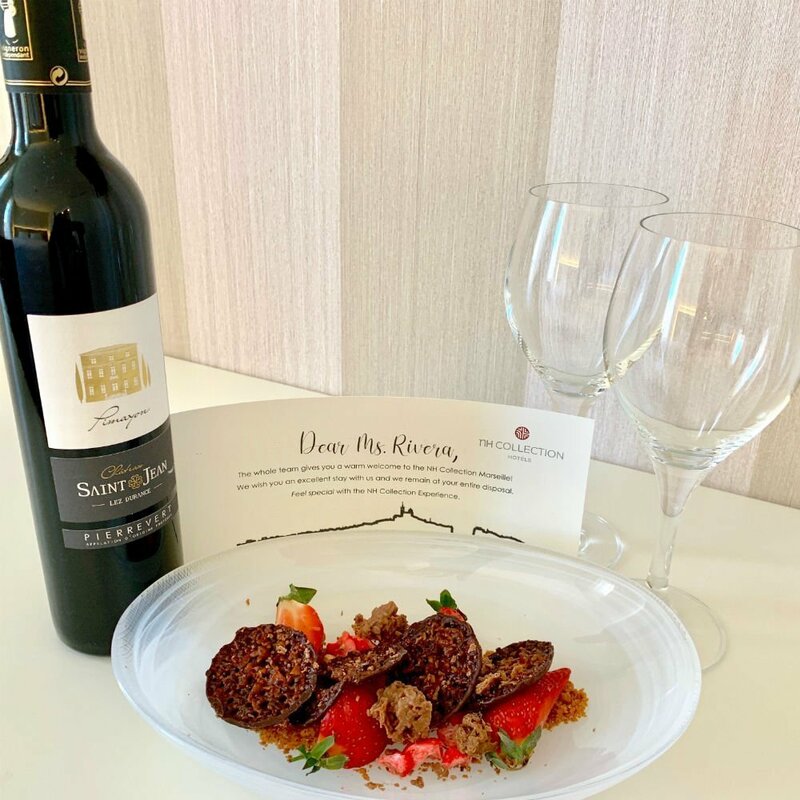 When you hear the phrase ‘welcome home’ on arrival, you know you’re in for a great stay. Convinced? You should be! 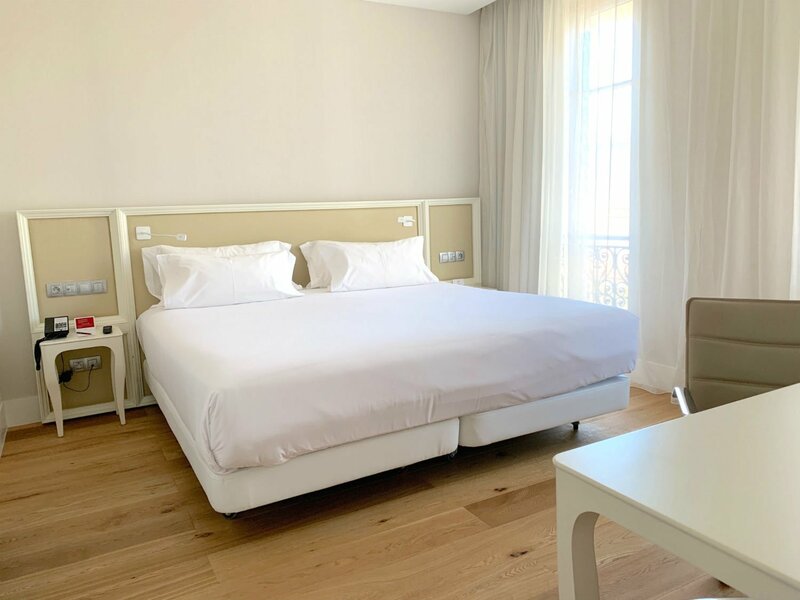 Check their rates and make your stay a reality at NH Collection Marseille. Is it expensive in Marseille? The answer to this really depends on where you’re coming from, and also on what you’re spending. Other fellow (northern) Europeans may find the prices fairly standard. Travelers coming from further afield may find them higher than average. Like most destinations, you can find competitive prices for accommodation to suit your budget. Food and drink again vary by location and the type of restaurant. By the main hub of the old port many of the restaurants around the harbor can get expensive. I’ve never been a fan of the menu du jour (menu of the day) as the food’s never as good. Just my experience. It’s possible to eat cheaply if you’re on a budget. There are many decent boulangerie (bakeries) to take fresh bread and savory goods that won’t break the bank. Marseille also has a large North African community (Algerian, Moroccan, Tunisian), where you’ll find plenty of local eateries too. What do you think of Marseille? Is it a city you’d like to explore in a weekend? Leave me a comment below! *prices correct at time of travel. Oh the Panier neighborhood looks dreamy! It was my favorite part of the city! The place is really beautiful, I just love the view and the way you gave a detailed info about it. It made me love it more. Amazing! Your photos are beautiful and I can only hope to visit this place sometime in my lifetime! Thanks for sharing! This Marseille itinerary is good. On my birthday, me and my boyfriend is planning to visit there. A great detailed list you have there about Marseille. I have yet to visit this city. The information and tips are just great for me for my future travel. Stunning photographs. I have been to France twice but could not visit this beautiful destination that time. What beautiful photos you have. It looks like a city that I would love to walk and walk and walk. The Panier neighbourhood looks lovely and the Marseille Cathedral looks like a cathedral I could spend a lot of time. I love the hotel too. It looks very posh and also reasonably priced. Looks like a really fascinating city. I studied a little bit about Marseille (or Massalia) at uni so I’d love to see it for myself one of these days. I didn’t realise it’s famous for its soap! I have been to Marseille a very long time ago and this post revamped in me the desire to go back. Lovely photos and precious hints! You are so right – Marseille is gritty. We called it edgy. We spent a week and thoroughly enjoyed ourselves and visited all the places you have mentioned. We loved the small restaurants around the back streets of the Port. The Hop on Hop off Bus got us around Marseille and up to the Cathedral. Loved your article it brought back memories. This is a great Marseille itinerary. We hope to visit there soon. Your photos are great too. Marseille is so pretty and unlike Paris it looks much less crowded. I just totally love your suite. The fort looks gorgeous, somehwere I would love to visit in an eye blink. Even the Marseille cathedral is so enormous and beautiful! 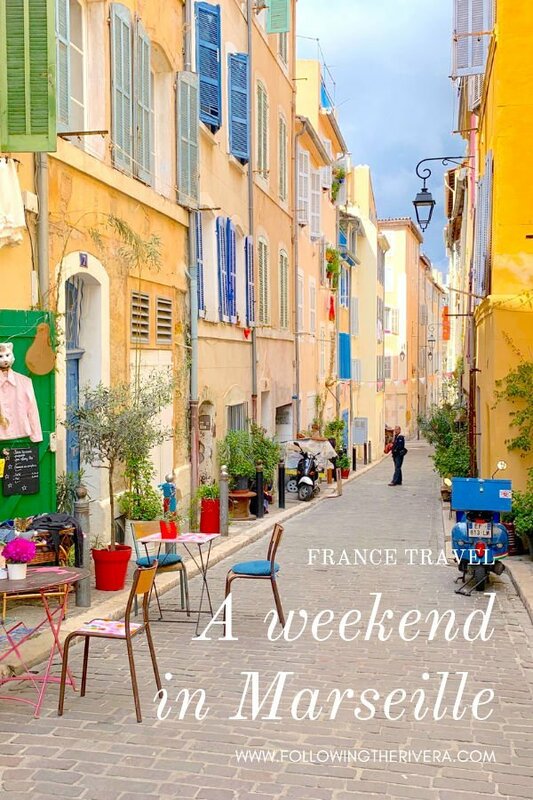 Marseille looks like a perfect French town and the itinerary is simply great. I love the vibrant Panier, would love to explore this street. The Navettes don’t look like biscuits anyway, wouldn’t mind trying them though. They also have an interesting flavor! What else a city can offer – ancient charm and modernity together is a rare combination. Glad to know that Marseille has both. I would definitely take the bus, uber sounds too expensive for budget travelers. It’s a great itinerary, I would stay for a couple of more days if I visit Marseille. Ever since I read the Count of Monte Cristo, I’ve been wanting to check out Marseille. I remember when Anthony Bourdain visited Marseille and talked about the more…old and dirty…side of it. I was intrigued because it was full of history. Visiting the old port would be a trip for sure. And Château d’If, but mainly because of its connection to the book. Beautiful places all around the world that we can’t get enough of thou Norte Dame got burnt recently it’s still all beautiful. The Panier neighbourhood is so beautiful. I love all the history and architecture of the city. I also love the azure blue coast. I don’t know if one weekend is enough with how beautiful Marseille is. Good detailed list you have there about Marseille. I always struggle to choose sights to see for such duration. This ready made itinerary is truly helpful. Visiting the medieval fort and walking streets of Panier are must do for me. Great pictures. 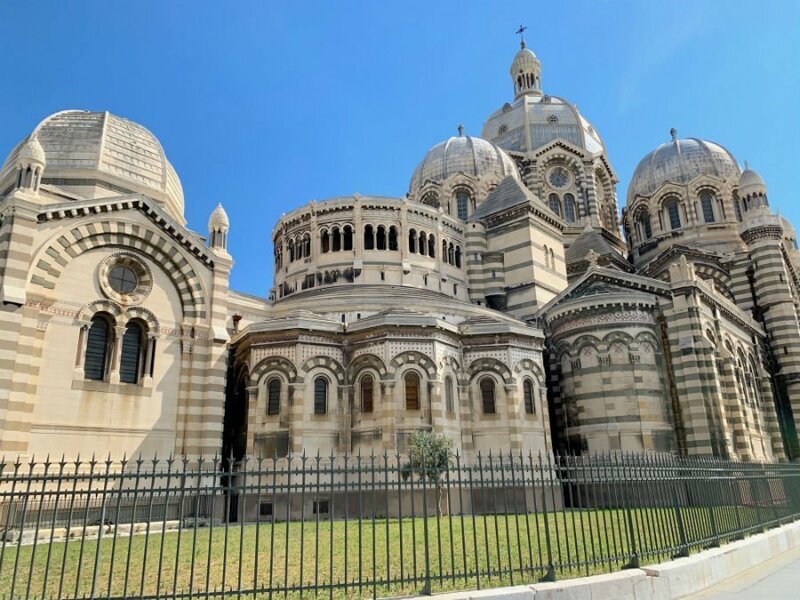 I’ve always heard about Marseille, but pictured it completely different, I didn’t know it was France’s second largest city! I know Uber is more expensive than public transportation, but I don’t think I’d have the patience for it not being a “straight shot” so I’d splurge on the Uber! I’ll be sure to stay out of the touristy areas once I visit. Interesting to learn that Marseille has such a high number of Italians living there, I’d love to try their food! It was something interesting to us too, as we spend a lot of time in Italy. And yes, we took the Uber too! 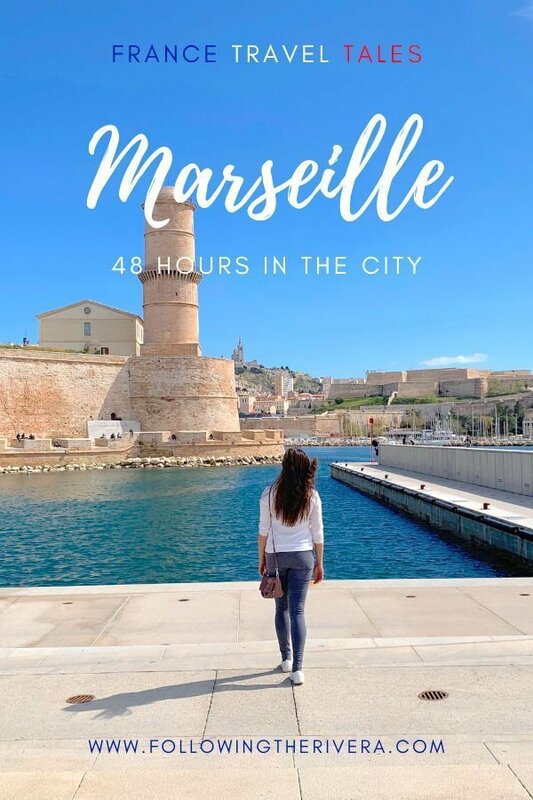 Great guide for Marseille, Lisa! I’ve been in France so many times, yet never visited this city. Good to know that Marseille is famous for biscuits and soap. Having a sweet tooth, for me the ‘Navettes’ sound way more appealing the famous ‘Savon de Marseille’ lol! Thank you! Lol, yes the navettes are more appealing than trying the soap! Get me to Marseilles! What a timely post with everything going on in Paris right? This is really an amazing post with so much great information; thank you especially for your pictures! It’s my dream to visit France. It’s so great getting a real person’s advice. Thank you, that’s means a lot! Marseille looks like an amazing destination! The Cathedral would be high on my list. It looks stunning! It sounds the perfect place to spend a couple of days. I am definitely keeping this destination in my mind! It’s such an interesting city to visit, yet typically French. Definitely visit one day! Such breathtaking views! I really fell in love with this place, hoping that will see these personally. I love this so much! Marseille Cathedral looks stunning from the inside out. I could spend hours exploring this beautiful architecture. Those small alleys also create a good backdrop for photos for IG. It’s a gorgeous place, and a great backdrop for IG; I should know, I took a few! Now I could kick myself. We skipped Marseille believing it to be just a big ugly city but it looks lovely. I would love to roam the old town and see the cathedral. Looks like we will passing quite close again this summer, so saving this post! What a fantastic guide and itinerary for Marseilles. I really must visit Marseilles one day, it looks absolutely beautiful! 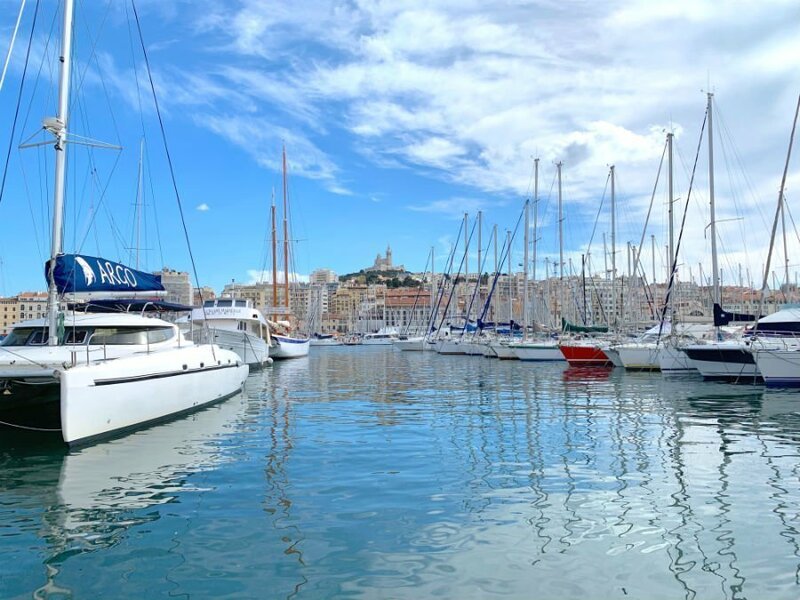 Thanks for sharing this useful post on the various activities to do in Marseille. It will be helpful for guiding those who are visiting Marseille. this is full of helpful information when traveling. It looks amazing here! Wow this looks like an interesting place! I hadn’t heard about this place before. Thanks for giving me some new information today! Marseille sounds like a great city to explore over a weekend, Lisa. Especially since you say that it’s so walkable, I love cities that are pleasant and easy to cover by simply walking around. The Old Port, with its market stalls and live performances, sounds like a great place but I also love the Notre Dam de la Grade, it looks beautiful both from the outside and inside and the views of the city from there are super! I feel particularly drawn to the streets of Panier! Thank you so much for sharing these informative trivias about Marseille. Love to taste those Navettes and Pizzasaround the place. Savon de Marseille sounds a really nice remembrance or souvenir. What a stunning view! Marseille is simply breathtaking! Thanks for sharing! Thanks for sharing your photos. I have yet to visit France but already had an idea about what to expect of the place. The marbles inside the Marseille Cathedral is impressive as well as the Abbey of St. Victor. I can just sit and relax at the pew for a long time to admire the interior of both churches. I found the fact that over one third of Marseille population can trace their roots back to Italy is interesting. I wonder if they speak Italian, too. What a gorgeous town! I love the church architecture, and the little streets and alleys are so cute. I had no idea the number of Italian immigrants in Marseilles – if there are lots of pizza places there, that’s even more motivation to go! I love that you included the best views of the city in this guide. One of my favorite things is to sit with a sketchbook or a journal and just watch the city come to life! These are all great recommendations in Marseille and you’ve included so many hidden gems that I haven’t seen. Okay now I have moved this further up my must visit list! what a gorgeous trip! Thank you! Yes it really is!